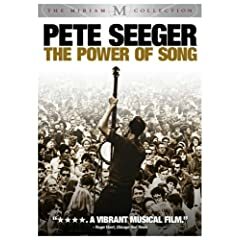 Of this week's DVD releases, I am most looking forward to the documentary, Pete Seeger: The Power of Song, which not only chronicles the life of the folk legend but also features the artists his music inspired paying tribute. When did Cliffs Notes start re-releasing films based on classic literature? This week the study guide releases The Crucible, A Farewell to Arms, The Grapes of Wrath, and A Midsummer Night's Dream to the collective groan of English teachers everywhere. Of the television releases, I will definitely be picking up Anthony Bourdain: No Reservations Collection 3 and the animated Ben 10 - Season 4 and the first season of Code Monkeys. The most surprising television release for me is Terminal City: The Complete Series. I received a review copy of this comedy series, and was charmed by its skillfully developed premise (a woman just diagnosed with cancer becomes a reality television star).